Norouz is only a few days away folks! 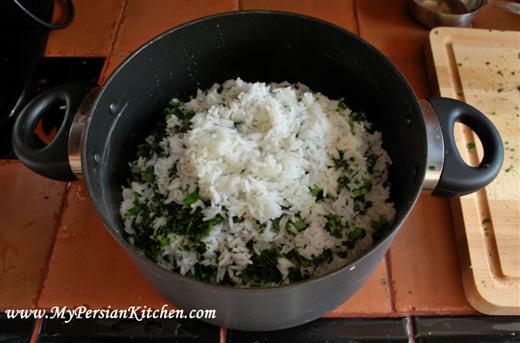 Today’s post showcases yet another dish that it traditionally consumed for the Persian new year. 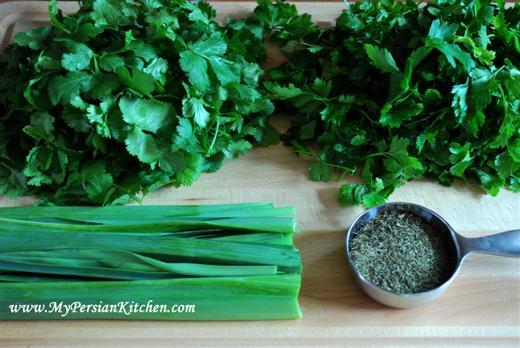 Last week I posted Reshteh Polow and this week we have Sabzi Polow Mahi and Kuku Sabzi. One thing you will notice in all of these dishes is the abundance in which fresh herbs are used. There is a very good reason for that! Fresh herbs symbolize rebirth. This is very appropriate for this time of the year as with the arrival of spring brings new life in nature. It is also customary to eat fish on the first day of the new year as it symbolizes life. 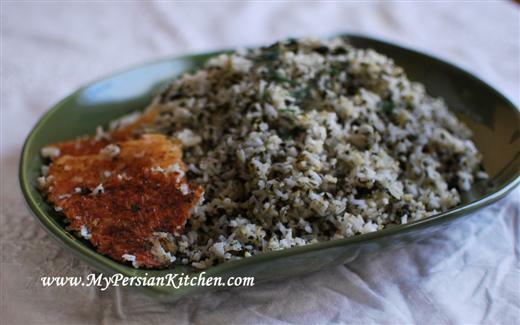 Sabzi Polow is always served with fish. 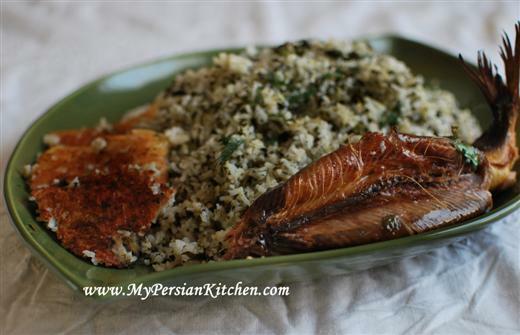 The combination of Sabzi Polow and fish goes extremely well together and I love to eat them any time of the year. Through the years I have made the fish portion of this dish in different ways; either it being fried or baked. This year, for the sake of this blog I decided to go with one of the popular options, smoked fish. One of the challenges of this rice is to have a good ratio of herbs and rice. 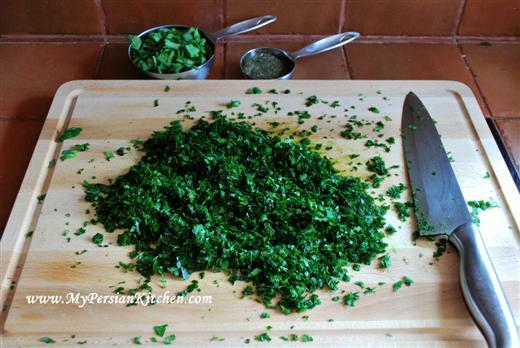 I think you should use a minimum of one cup of parsley/cilantro per cup of rice. Also, I opt to use dry dill because I found that it is an easier option and decreases the mounts of herbs that I have to clean. Mix them all together making sure to add some salt so that the herbs are seasoned. 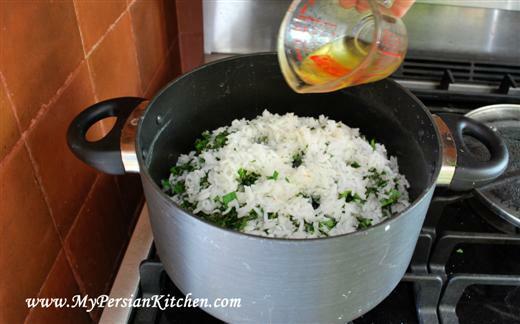 Place 2 tablespoons of canola oil, water, and 1 tablespoon of brewed saffron at the bottom of the pan. 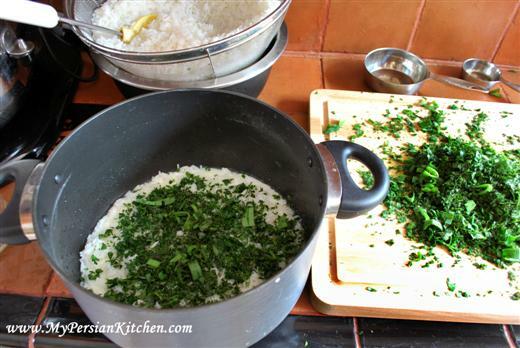 Place one thin layer of rice and add a generous amount of herbs. Continue layering making sure that you end with a layer of white rice. With the back of a spatula create some holes in the rice. Cover and cook for 10 minutes on high. Then mix 2 tablespoons of brewed saffron and 2 tablespoons of butter or canola oil and pour over the rice. Place a towel over the lid, cover the pot and cook on low for one hour. 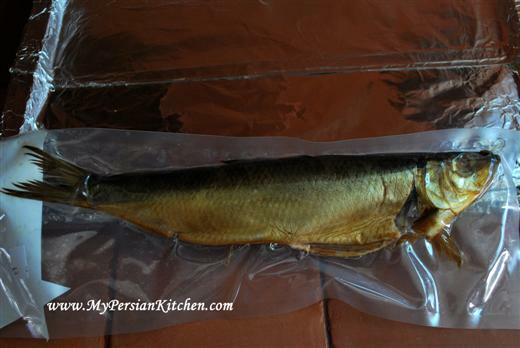 My local Persian Market always carried Smoke Fish. This time they only had Herring. 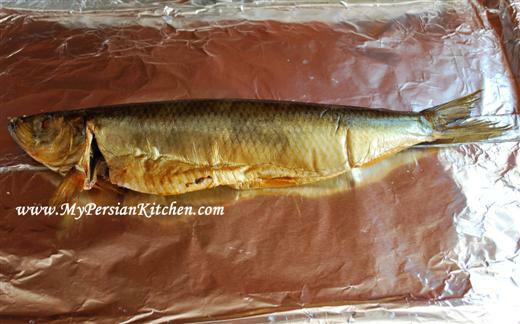 I simply placed the fish on a baking dish lined with aluminum and warmed it up in a 350º oven. Truth be told I left it a little too long. Lesson learned was to only leave it for a few minutes. Some people opt to add Advieh to Sabzi Polow, personally I don’t because the herbs have such a delicate flavor and I think that advieh slightly overpowers the taste and smell. A good addition to this dish would be layering fresh baby garlic with the rest of the herbs. Unfortunately, the day I went to the store, they didn’t have them. I have to confess that I am generally a fan of smoked fish, however, this smoked fish wasn’t particularly good. I found it to be too salty and we ended up throwing it away. It was worth a try though! So glad I found your site today. I love the step by step photos. You are the Pioneer Woman of Persian cooking! Erin, you had me laugh from the bottom of my heart! P-Dub is pretty cool, so I am totally cool with being the PW of Persian cooking!! Eideh shomam mobarak! Ιt looks that fish is a symbol of life in many cultures. JSteen, best of luck to you!!! You can do it!! It’s interesting. I’m Persian Armenian, so I don’t really celebrate Norouz, but this meal, along with Kuku Sabzi is what we have on Easter Eve. Tonight! Thanks as always for the great posts. i just wanted to point out to you that fish is actually not vegan. Vegan means that there are no animal products in the meal, and a fish is a living creature, so adding fish to a meal would make it not vegan. Vegan defender, I am fully aware that vegans don’t eat animal products of any kind. The vegan reference is to the rice itself as seen in the very first picture, when made without butter. @vegandefender I think any vegans on this site looking for recipes would realize they should probably skip the fish in this dish! I use that fish here, I also thought it was too salty the first time I made it and my mom informed me I was supposed to wash and soak it in water to remove the intense saltiness from it. I am going to try that next time I make it and see if that works better. Hi! I just wanted to know if you could add dry sabzi and how should you cook it before adding it to the rice?…Thank you! Nankali, yes, you can. 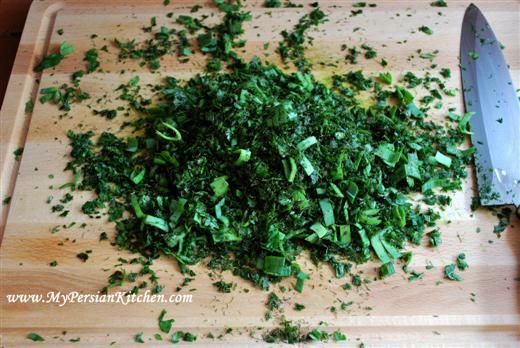 The general rule is about 1/4 cup of dry herbs per a cup of fresh ones. Remember that dried herbs have a stronger flavor.